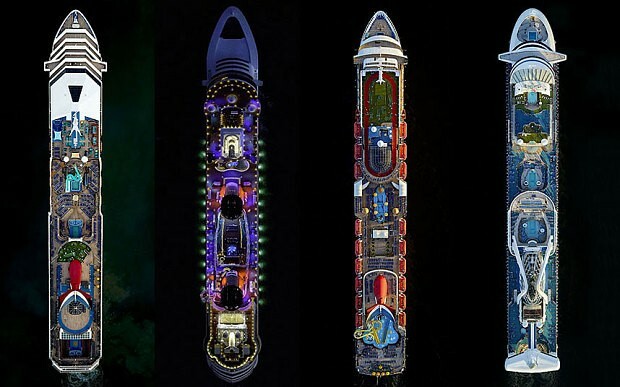 You are at:Home»News»Check Out These Amazing Aerial Photos of Cruise Ships! 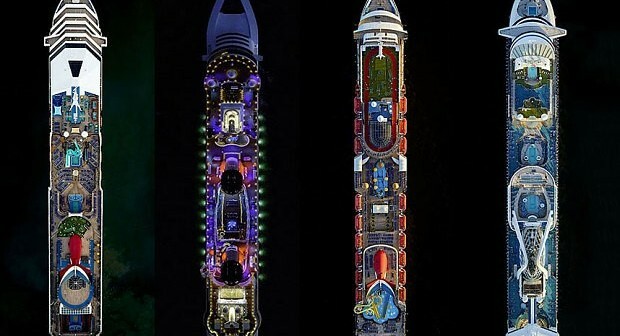 Check Out These Amazing Aerial Photos of Cruise Ships! With lengths of up to 360 metres, weights of over 225,000 tonnes and passenger capacities of more than 6000, the world’s most luxurious cruise ships make quite the impression. And with 360 degree video tours, dedicated YouTube channels and high resolution photographs now available, imagining yourself on-board these maritime marvels is easier than ever. Of course, there’s always room for improvement and when New Yorker photographer Jeffrey Milstein managed to capture incredible bird’s eye shots of some of the world’s largest liners, we were seriously blown away! A stunning bird’s eye view of the Disney Dream and Norwegian Sky. How do Carnival Sensation and Carnival Victory shape up to each other? Luxury liner or work of art? While the cruise ship photos have only just been published the series is part of an ongoing aircraft project that began in 2013. To capture the amazing images Milstein uses an 80 megapixel digital camera with a gyro stabilizer. He has to keep standards high seeing as his work is set to be showcased at New York’s prestigious Benrubi Gallery from July 9th to August 22th. As well as being leisure spaces, Milstein also explores the manufacturing feats of cruise liners, explaining that the larger vessels “are fascinating to ponder as engineering marvels.” Are they worthy of an art gallery? Milstein certainly things so! “Seen as a typology, they share a common symmetry derived from function, yet juxtapose design elements both decorative and functional that set them apart,” he said. A whole new perspective on Caribbean Princess and Carnival Victory! Craving a cruise holiday on-board one of these luxurious ocean liners? Head to the Cruise 1st, where you can secure incredible deals on a huge range of itineraries. Who knows, you might just get snapped by a helicopter bound Milstein while you’re lounging by the pool, strolling down the promenade or sweating it out on the basketball court! Royal Caribbean’s Freedom of the Seas and Majesty of the Seas.